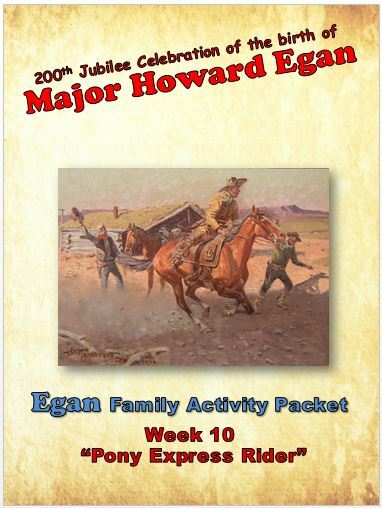 PONY EXPRESS TRIP to celebrate the Pony Express segment of Major Howard Egan’s life. Howard was not only the Superintendent of the Pony Express line, from Salt Lake City to Carson City, but on April 7th, 1860, he was also the first pony express rider to bring mail into Salt Lake. The pony on this run was a very swift, fiery, and fractious animal. The night was so dark that it was impossible to see the road, and there was a strong wind blowing from the north, carrying a sleet that cut the face while trying to look ahead. But as long as he could hear the pony’s feet pounding the road, he sent him ahead at full speed. All went well, but when he got to Mill Creek, [which] was covered by a plank bridge, he heard the pony’s feet strike the bridge and the next instant pony and rider landed in the creek, which wet Father above the knees, but the next instant, with one spring, the little brute was out and pounding the road again and very soon put the surprise on the knowing ones. And here let me say, it was a very long time before the regular riders came up to the time [Father] made on this first trip, if they ever did.” –Howard Ransom Egan. 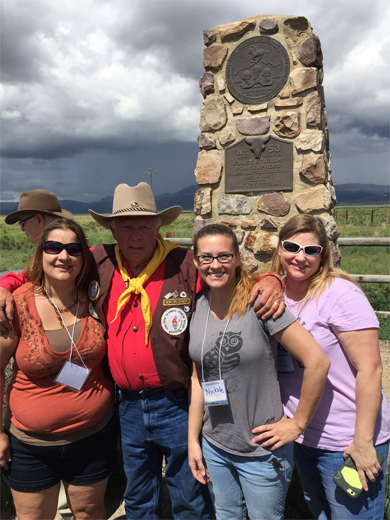 To experience a little of what Howard experienced, some 90 descendants traveled in car-caravans along the Pony Express Trail, with historians giving presentations along the way. After an orientation, the group followed Highway 73 to Camp Floyd, site of the Fairfield Station. 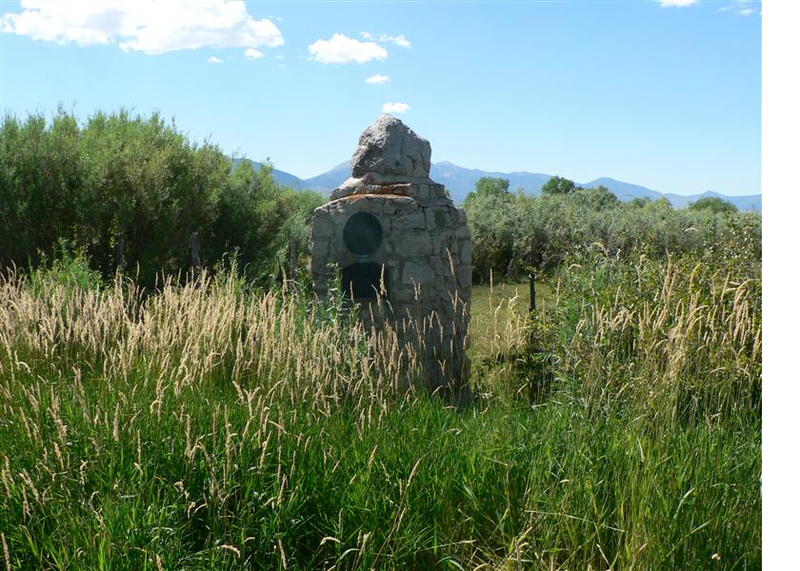 Camp Floyd was built by Johnston’s Army of some 2,000+ soldiers at the end of the Utah War. The surrounding village soon became a raucous town of 7,000 people, making it at that time the third largest city in Utah. The Pony Express Station was a small adobe building, a block northeast of the still existent Stagecoach Inn. The next stop was Faust’s Station, named after the operator, Henry Jacob Faust. It was the first “Home Station” west of Salt Lake City – a place where riders were provided room and board between runs. The station was a large log structure with a low, pitched roof, located in the meadow approximately ¾ of a mile south of the site of the current stone monument. Next was a stop at Lost Spring Station, built at “Simpson’s Springs” near the most dependable watering point in the desert region. It was the “last water stop” for travelers heading west. The site has an information kiosk, a monument, and a restored structure built in 1976. The group drove past four more Station sites, each with nothing more than a commemorative monument. But each, haunted by exciting Pony Express adventures. Boyd’s Station was a small, one-room stone cabin with gun-ports. A well was dug to try to provide water, but it was all brine, so strong they used it to cure meat. The stabilized ruin at Boyd’s Station survives as one of the best preserved Pony Express Stations in Utah. We passed three more Station sites, some with monuments, some without, but each one, rich with history and Egan pony express stories. The last stop was Egan’s Station at Deep Creek, in today’s Utah town of Ibapah. Deep Creek was Howard Egan’s home, and the most westerly Pony Express station within the present boundaries of Utah. The principal building consisted of a bunkhouse, kitchen, and dining area. Outside was a large chicken house, stables, Telegraph office, gardens, blacksmith shop, and barn. One of the historical monuments at this site features explanations of Deep Creek Station, the Goshute Tribe, and early settlers, along with a picture of Howard Egan. The other monument features the Pony Express. Having spent the day on the pony express trail, Egan’s descendants headed back to Salt Lake City. The Pony Express mail service only lasted for 19 months, ending with the completion of the Overland Telegraph line in October of 1861. But there was something magical, romantic, daring, and adventuresome about it. And it caught the curiosity and emotion of both the country and Egan’s descendants. The Pony Express days seemed to represent the very essence of the American experience and the rough-riding spirit of the age. 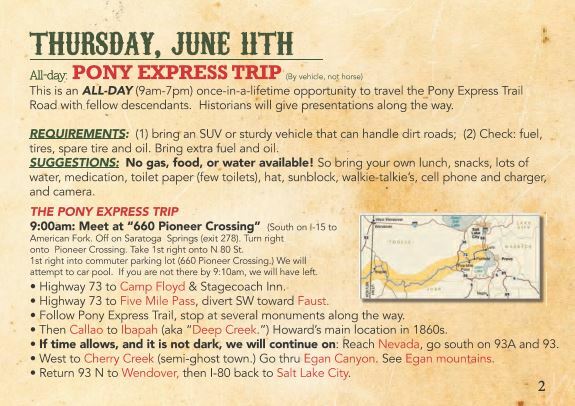 This handout identifies and discusses every Pony Express (PX) station from Salt Lake City to Deep Creek. Our tour starts in Lehi, after the first 3 PX stops. MAJOR TOUR STOPS are identified in BOLDFACE PRINT. After each stop, read through the pages telling material that covers from that stop to the next major stop. The lives of Howard and his sons Howard Ransom and Richard Erastus’ (Rastus) are best known perhaps as Pony Express participants. All three were riders, but the sons rode the most. Howard managed a Pony Express division, its stations, riders, and remounts for 322 miles in western Utah and eastern Nevada desert regions. But Howard deserves credit in history more for his overland stagecoach mail business than his Pony Express work. Transcontinental telegraph lines that first connected in October 1861 killed the Pony Express mail, but not the overland stage coaching of mail and passengers. For the next seven years Howard, from headquarters in remote Deep Creek and from Salt Lake City, supervised stage coach operations for western Utah and across Nevada. Many Pony Express stations became stagecoach stations. Today’s Pony Express Trail is celebrated and honored as a national historic trail. However, those traveling this trail route should give as much or more attention to the stagecoach story as they do to the Pony Express. Item 1: Although the Pony Express mail service formally lasted just for eighteen months, from April 1860 to October 1861, its exploits are legendary and its story excites imagination. Young, small riders. Fast horses. Super-quick changes of mounts and mail pouches. “The mail must go through” determination, bravery, and heroic endurance. Daring riders racing night and day through deserts, heat, wind, and snow. Downed horses whose riders shoulder-carry mail to the next station. Narrow escapes from Indians. Mail stations burned and remounts gone. 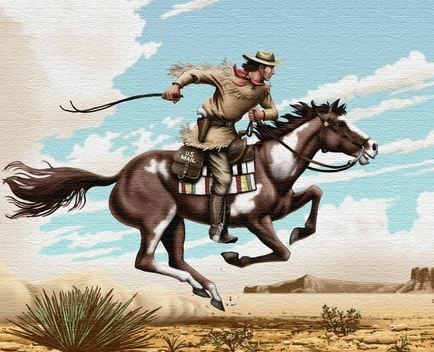 Item 2: The Pony Express was a mail service delivering messages, newspapers, mail, and small packages from and to St. Joseph, Missouri, across the Great Plains, over the Rocky Mountains and the Sierra Nevada to Sacramento, California, by horseback, using a series of HOME and RELAY stations. Officially operating as the Leavenworth and Pike’s Peak Express Company of 1859, which in 1860 became the Central Overland California and Pikes Peak Express Company, this firm was founded by William H. Russell, Alexander Majors, and William B. Waddell all of whom were notable in the freighting business. From April 3, 1860, to October 1861, it became the West’s most direct means of east–west communication before the telegraph was established and was vital for tying the new state of California with the rest of the United States. During its 19 months of actual operation, it reduced the time for messages to travel between the Atlantic and Pacific coasts to about 10 days. Item 3: Up until 1859 travelers overland to California followed the California Trail that looped north of Great Salt Lake and followed the Humboldt River southwest across Nevada. Howard located a more direct, Central Route. For Chorpenning’s mail, he found ways to cross western Utah and Nevada by going south of Great Salt Lake and across Nevada to Carson City. Government explorer James Simpson refined some of that central route. The Pony Express used that route. So did the 1861 overland telegraph, which service killed the need for the Pony Express. The Egan/Simpson route became suitable for wheeled vehicles. So was the overland stagecoach route until the transcontinental railroad opened in 1869. Item 4: Howard superintended much of the PX route from Salt Lake City to Roberts Creek, NV (which is about midway across the state of Nevada, about 20 miles northwest of today’s city of Eureka). All 5 five division superintendents took orders directly from Mr. Ficklin in Salt Lake City. 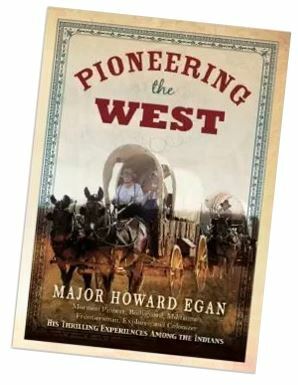 Two noted historians of the Pony Express said of newly-hired Howard that “his knowledge of the West was inferior to none.” Eight or 10 of mail contractor George Chorpenning’s stagecoach stations were already in use in Howard’s district, so they could be used. But, he needed to double the number. Howard’s district occupied the most difficult and dangerous division on the whole Pony Express line. Howard and his sons Ransom and Erastus were Pony Express riders. By spring 1860 Ransom was barely 20 and Ras barely 18. The Egans’ fine little book Pioneer the West (we abbreviate it PTW) contains many Pony Express stories, making it one of the best sources historians use for studying the Pony Express. Item 5: The Pony Express consisted of 184 stations often located in existing buildings. Some were set-up in military forts, others were built from scratch. The entire route was divided up into five divisions: St. Joseph-Fort Kearny; Fort Kearny–Horseshoe Creek; Horseshoe Creek–Salt Lake City; Salt Lake City-Robert’s Creek; and Roberts Creek–Sacramento. The mail needed to cover 250 miles per day. In order to maintain a rigid schedule, 157 relay stations were located from 5–20 miles apart as the terrain would permit. At each RELAY STATION riders would exchange their tired horses for fresh ones. On one ride, the rider changed horses six to eight times. At HOME STATIONS they enjoyed room and board before riding back on their route. This relay carried mail across the continent in record time. During the Pony Express’s brief 19 months it greatly reduced the time it took for messages to cross the west half of the country (telegraph served the other half)–10 days between St. Joseph and Sacramento. Item 7: At first a half ounce of mail or fraction thereof cost the sender $5.00, or about $147 today. (An 1860 dollar would equal about $28.50 in 2014. See: http://www.measuringworth.com/calculators/uscompare/relativevalue.php) Later, in August 1860, one-fourth ounce letters were accepted at $2.50 each, and then for $2.00 in April 1861. As of July 1, the half-ounce rate reduced to $1.00. In addition, each letter had to pay the government’s normal ten cent postage. Common people couldn’t afford such prices. The mail was carried in four small leather bags called cantinas, about six-by-twelve inches in size, sewed to a square mochila put over the saddle such that one letter bag was in front and one behind each leg of the rider. Three bags contained through mail, and these were locked and not opened between St. Joseph and Sacramento. One bag carried “way mail” being delivered along the way. Item 8: One trail expert noted that “The Pony Express enterprise was in an almost constant state of flux. Stations were often being added, some as replacements, some as new ones. Stations were destroyed and some abandoned. A temporary station might be replaced by another structure in the same area.” Because the route changed slightly from time to time, an etched-in-stone list of stations in place at the same time isn’t possible. Station 105. The Salt Lake House, 143 South Main Street, was known as a Home Station, a place where riders were provided room and board between runs. Similar in construction to Brigham Young’s Beehive House, it was the Pony Express Headquarters for the inter-mountain west. The station was relatively large, and for a Pony Express station, rather lavish. The building served as both a Pony Express Station and as a hotel and restaurant for other travelers. Horace Greeley, Mark Twain, and Sir Richard Burton all stayed as guests of the hotel. It was a long two-story structure with a front balcony. A large livestock yard was in the back of the building. After the Pony Express ended, the Salt Lake House continued as an Overland Stage stop and hotel. A 1961 marker honors Ben Ficklin, General Superintendent, and Major Howard Egan and James C. Bromley, Division Superintendents, headquartered there. It names “honored Utah riders” including Howard Egan, Howard R.Egan, and Richard E. Egan. Station 106. Trader’s Rest/Traveler’s Rest Station (N40 37 59.9 W111 53 21.8) (M). The west-bound pony rider proceeded south along today’s State Street to this 1st pony express station out of Salt Lake City. It was located just north of 7200 South Street on the west side of State Street. Constructed of adobe, in later years the structure was covered with wood siding and a false front and re-converted into a business. More recently it served as a garage. This station was probably used only for a short time, and no evidence of its existence can be found at the site. The location is marked by a granite marker placed by the Pony Express Trail Association. Station 107. Rockwell’s Station (N40 29 07.0 W111 54 14.0) (M) was 10 miles south of Trader’s Rest. It’s location is just south of the Utah State Prison. This was at Porter Rockwell’s Hot Springs Brewery Hotel. The hotel and brewery made this a popular stopping point for travelers. A large adobe barn stood at the site well in to the previous century. A stone monument (N40 29 10.0 W111 54 01.0), largely vandalized of plaques, can be found at the south-east corner of the prison compound and north of the highway. The site is on the pass between Utah Valley and Cedar Valley. Nothing remains. There is a monument (N40 21 23.0 W111 59 18.0) at the bottom of the pass on the east side. Use of the station after 1861 is unknown. It may have continued in use as a stage station. The location is 8.25 miles from Dugout Station. It is in the Camp Floyd/Stagecoach Inn State Park. 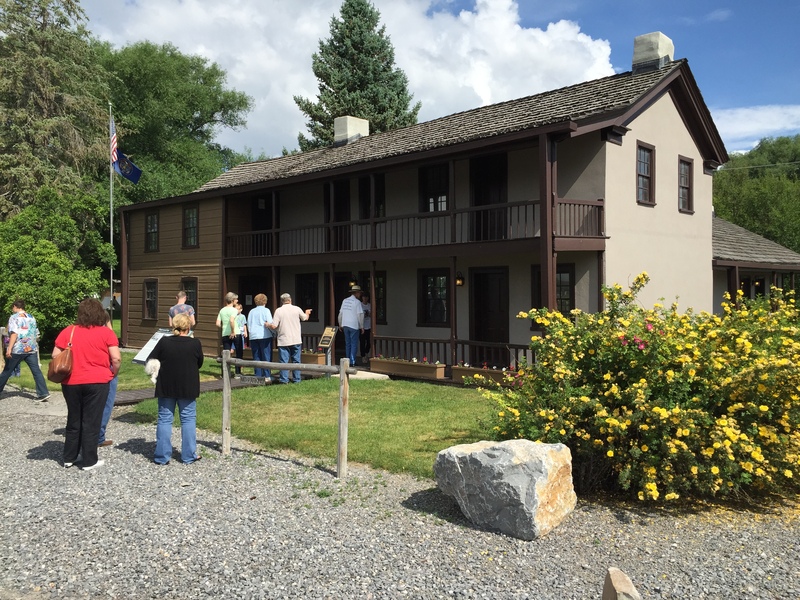 John Carson’s Stagecoach Inn served as an inn and a station for the Overland Stage. The Pony Express Station was a small adobe building about a block northeast of the Inn. Soldiers at Camp Floyd, knowing that civil war seemed eminent, eagerly waited for news from the East on “Pony Days.” When the pony express mail was to arrive, a lookout was stationed on the roof of one of the camp buildings to raise a cry when the pony rider came in sight. General Johnston in 1858 assigned Captain James Simpson of the Army Corp of Topographical Engineers to make a preliminary reconnaissance west to find a central route to California. Late in 1858 his expedition went about 70 miles on the route Howard Egan had developed, then returned. May 1859 he went again, and went all the way to near Carson City, Nevada then returned by a different route. The next year the Overland Stage and the Pony Express used that Egan/Simpson central route. Item 10: Rastus Egan:“A Rather Unpleasant Experience,” PTW 281-282. On another occasion I rode from Salt Lake City to Fort Crittenden [Camp Floyd’s new name], a distance of fifty miles, then started at sun down for Rush Valley in a very heavy snow storm, and the snow knee deep to my horse. I could see no road, so that, as soon as darkness came on, I had to depend entirely on the wind. It was striking on my right cheek, so I kept it there, but, unfortunately for me, the wind changed and led me off my course, and instead of going westward I went southward and rode all night on a high trot, and arrived at the place I had left at sundown the evening before with both myself and horse very tired. Now the only thing to do was to jump on to the horse I had rode in the evening before and proceed on twenty five miles further. Then, instead of having a night’s rest at my home station, I was riding all night in consequence of which I met the “Pony” from Sacramento and was compelled to start immediately on my eastward trip to Salt Lake City. This made my continuous ride 150 miles besides all night in deep snow. 10 miles from Camp Floyd. The site is in Tooele County in Rush Valley. This station’s stone monument is out on the flats at the site, while heading west from Utah County toward Faust on Faust Road, which is also the original Pony Express Trail. Faust Road begins at Five Mile Pass on the county line between Tooele and Utah Counties, and ends at Faust near Vernon. East Rush Valley Station, built as a dugout, was listed by Howard Egan as being very active even though it is not identified as a contract station. The military road ran just to the south of the station, toward Vernon, and is still quite visible today. Item 11: Erastus Story, 1862 “Trip To Ruby,” PTW 217-220. I noticed that those on the coach, I could see, were all heavily armed. I supposed there had been a rabbit hunt, as there were on frequent occasions in the fall. When we reached Faust Station we found there had been a hunt, not a rabbit hunt, but a man hunt, and the men that were hunted were in that stage coach with the sheriff. One, Lot Huntington, being dead, and the other a prisoner. The latter was killed while trying to escape after arriving in Salt Lake City. Just one more incident. My brother-in-law was riding west from me and had a sweetheart in Salt Lake City whom he desired to see, but could get no leave of absence to go see her and I naturally had sympathy for him, so we got our heads together and agreed to accidentally (on purpose) pass each other in the night and he would have to ride his route and continue on mine. But he had all night in Salt Lake to rest or spark as he choose and return the double route next trip. But with me it was different for after I had rode the double route, 165 miles I met the “Pony” from west and had to turn around without any rest and ride over the double route again, making a continuous ride of 330 miles and again I was tired. The monuments were constructed in the late 1930’s by the Civilian Conservation Corps (CCC) and the workers were stationed at a CCC camp at Simpson Springs, and left a legacy of monuments, trails, and other improvements around the region. Each monument featured two bronze plaques. One was a circular Pony Express Rider plaque, sculpted by A. Phimster Proctor. The other was rectangular, and gave information describing the nearby station. The plaques were provided by the Utah Pioneer Trails and Landmarks Association. Most of the bronze plaques have been stolen, but in recent years the Utah Division of the National Pony Express Association has been working with the BLM to maintain these markers and to replace the round horse-and-rider plaques. The monument at Five Mile Pass is typical of those found at the location of Pony Express Stations all across western Utah. Not much is known about the structure which was here or its use. Also known as Rush Valley Station, and Doc. Faust’s Station. The Faust monument can be seen about 30 miles south of Tooele on state Route 36 and five miles from Vernon. It was the first HOME STATION west of Salt Lake City for the Pony riders. The station was a large log structure with a low, pitched roof, located in the meadow approximately ¾ of a mile south of the site of the stone monument. The site is on private property owned by Tooele City. This station was established originally by George Chorpenning in late 1858. There is a question whether the stone building still standing at Rush Valley is the station house. The 1871 survey plat names this building Faust’s House, while the survey notes call it Faust’s Station. We are told the remains of a depression marked the structure known as the station house. It was apparently evident for many years to the east and north of the present structure. Faust Station was operated by Henry Jacob Faust, who was a native of Germany. He emigrated to the U.S. at an early age, probably around 1841 and attended medical school, but dropped out and went from Missouri to hunt for gold in California with the 1849 Gold Rush. 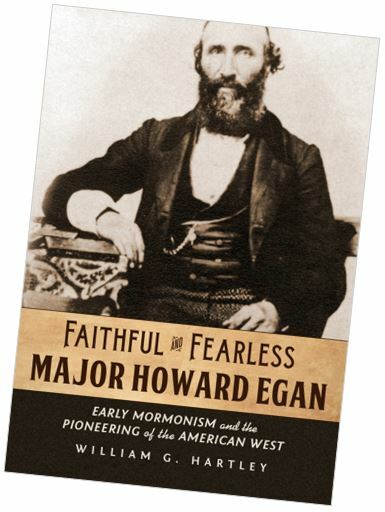 He wasn’t too successful with his endeavor and, since he had joined the Mormon Church, came to Utah in 1851. In 1860 he accepted a position as a station manager and part-time rider with the Pony Express and also raised horses for the Express and the Army. He was probably already there as an employee of George Chorpenning who had the mail contract before Russell, Majors, and Waddell. He and his wife survived a narrow escape with Indians while living at Faust. The property, which includes the stone building and a cemetery, is under private ownership and is closed to the public. The monument north of the area, is misplaced and the log structure across the highway to the east is often referred to as “the original station.” The station site was in a pasture south of the monument (N40 10 27.0 W112 25 39.0) on private land. There is a BLM information kiosk a few of miles to the west. In the early 1990’s, the Bureau of Land Management erected a Pony Express Trail Interpretive Site on the road to Lookout Pass to serve visitors who are crossing the desert to see the several Pony Express Station markers. The sign encourages visitors to respect the land on which they are traveling. Visitors to the Great Salt Lake Desert and Pony Express Trail are reminded there are no services on the Trail for over 100 miles between Vernon and Ibapah. “When all was supposed to be ready and the time figured out when the first Express should arrive in Salt Lake City from the east, they thought that, on account of the level country to run over, that they would be able to make better time on the eastern division than on the western from Salt Lake to California. Therefore, the two riders that were to run between Salt Lake and Rush Valley were kept at the city. The pony on this run was a very swift, fiery and fractious animal. The night was so dark that it was impossible to see the road, and there was a strong wind blowing from the north, carrying a sleet that cut the face while trying to look ahead. But as long as he could hear the pony’s feet pounding the road, he sent him ahead at full speed. 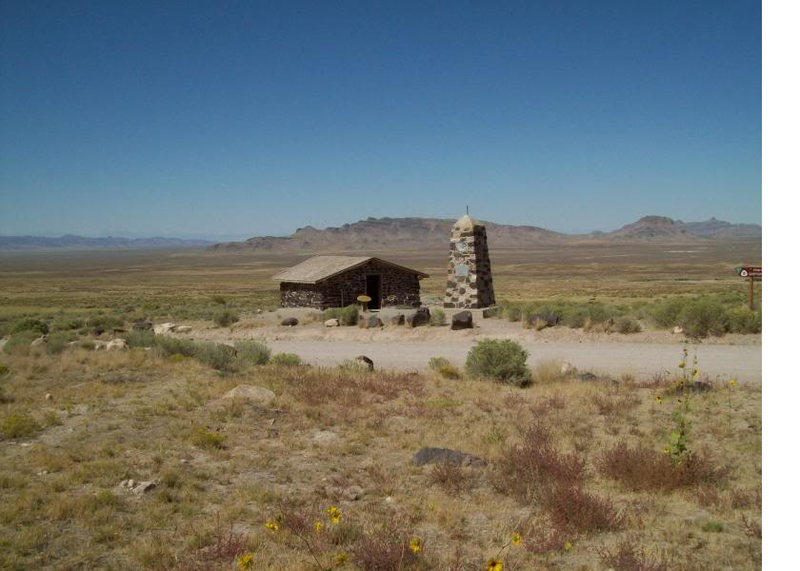 Also called Point Lookout, General Johnston’s Pass and Jackson’s, the station is on BLM land. Above a flat on the west side of Lookout Pass (General Johnston’s Pass in the PX days) you find the marker for the location. A rock alignment and the trace of the old road can be seen between the stone monument and a dam built to catch water from a small spring. An employee of Howard Egan stated that Egan built a small two-room log house here in April of 1860, but that the station was in ruins by the following September. From the top of the pass one can look west into the desert at what was to become known as Piute Hell. In May 1860, the Pah Ute War began, caused apparently because of white encroachment and depredations. For a short time, the Express was completely shut down (June-July). A small “pet cemetery” plot to the south, with iron railings, apparently contains remains of dogs. By 1876 Porter Rockwell’s brother, Horace, and wife Libb, lived in a small log house, perhaps the old station house. No other physical remains for this PX site can be found here. About 8.5 miles from Lookout Station. It’s debatable if a PX station ever was here. A telegraph relay station, operated by David E. “Pegleg” Davis, was located here in late 1861. The distance and topography between Simpson and Lookout would make this a logical location for a change of ponies, and it is speculated that the telegraph station may have been placed there because of buildings already standing. 8 miles from Government Creek. Even before the days of the Pony Express, freighting companies used the springs as a watering stop. George Chorpenning established a mail station at this site in 1858. The first east-bound Pony Express courier halted here about 5 p.m. April 7, 1860 and westbound about 2 a.m. April 10, 1860. The PX station that was here bears the name of explorer Captain J. H. Simpson who stopped here in 1858 while searching for the overland mail route between Salt Lake City and California. It was one of the most dependable watering points in this desert region. Captain Simpson first named the spring “Pleasant Spring” because of the good water. He later renamed the spring “Simpson Springs” because of the spring’s significance as the “last stop for water” for travelers heading west. The water became a necessity for the Pony Express from 1860-1861 and for the Overland Stage from 1861 to 1869. At the turn of the century, the spring was still being used by freighters hauling supplies from mining towns around Gold Hill to western Utah. It is still a key watering location for livestock. There is a monument and restored structure (reconstructed in 1974 by the FFA) located on a building site which dates to the period (1860) and closely resembles the original. The building at the site was rebuilt by the Tooele F.F.A (Future Farmers of America). Chapter in 1976 as a sesquicentennial project. The site, nature and use of the old buildings were determined by archaeological investigation. The BLM has developed the area and installed camping facilities. The site has an information kiosk and ruins of Alvin Anderson’s cabin. A Civilian Conservation Corp (CCC) Camp was built west of the site in the 1930’s. One can see remnants of it today.
. . . After leaving Simpson’s about three miles I thought (as I had many times thought before), it was a shame we had to go so many miles around to get a little ways to the west. At any rate, boy fashion, I left the road and took a straight line for Willow Springs. The first half of the distance I was able to make very good time, then the desert began to get softer as I went till finally about one inch of water was standing all over the surface as far as I could see in any direction. The pony sank to his fetlocks in the mu. That made it slow traveling. After about five miles of this kind I came to a little higher ground where I could make better time. In looking back I could see the little knobs of mud sticking up above the water. It seemed to me I could see them for miles. Well, I made Willow Springs all right and had saved a good many hours’ time. I expected to get considerable praise for this exploit, but nix. 8 miles from Simpson Springs is River Bed station, which lies on the floor of the ancient Sevier River bed formed by evaporation of Lake Bonneville that drained into ancient Lake Bonneville. The road drops into the old bed of the Sevier River and the site of Riverbed Station. It was built near the end of the Pony Express era, and is not mentioned in the mail contracts or schedules. Substantial structures were found here to serve the stagecoach line. A monument was established at the site by the Civilian Conservation Corp in 1939 or 1940. However, nothing remains of the station, but the original trail can be seen north of the monument. Located 8-10 miles west of River Bed Station, it was also known as Shortcut Pass. It is located east of Dugway Pass, which connects the Dugway mountain range to the north and the Thomas range on the south. The station was located 1½ mile south of the modern road. Noted as a “substation” by Horace Greeley, nothing very permanent was ever constructed at the site. Burton says (1860) that the station was simply a dugout roofed over with split cedar logs, with a crude adobe chimney. Three wells were attempted, the deepest being dug to a depth of more than 153 feet. All were dry, and water had to be hauled from Simpson or River Bed. A monument is located at the site today. Physical evidence at the station site is limited to a disturbed area containing poorly preserved metal objects (possibly from a corral or blacksmithing area north of the wash) and some concentrated stone. Item 18: Erastus Story: “Trip to Ruby,” PTW 217-220. 13 ¾ miles from Dugway. Also known as Butte, or Desert Station, it was named for the black basalt outcropping just to the north of the road and the monument. A structure of native black stone was apparently built here in 1861, as part of trail improvements undertaken by the Overland Mail Company after acquiring the Pony Express in July 1861. Other structures in the area are suggested. Little is known about Blackrock station, or its usage possibly due to it being a non-contract station. Informants say the station site lies west and north of the volcanic outcrop known geographically as Blackrock. Only a vandalized monument marks its general location. Item 19: Rastus Story, “Trip to Ruby,” PTW 217-220. When I reached the desert just east of Fish Springs, the road was very bad, mud hub deep, and my work oxen gave out when I was about four or five miles from the Springs and could not budge the wagon another foot. I had the driver unhitch from the wagon, take some grub for himself and the Indians, who had gone ahead with the cattle, and also take my pony and drive the team to water and feed, and come back next morning with one of the Indians to help get the wagon over to hard ground. When they came back next day we moved the wagon about one-half a mile, where the road was still worse than before. There were three empty coaches stuck in the mud within a half mile of us. Well, I simply had to get out of there some way. There was a part of the load I must not leave alone. So this is the way I managed it: We had a double cover on the wagon. We took them off and spread them out on the mud alongside the wagon and loaded the most of the valuables on it and folded the sides and ends tight over all, hitched the oxen to the end and away we went as easy as pulling a sleigh over a good snow road. There were two mail stations in this area: the one at Fish Springs first used by Chorpenning and another about 3 ¼ miles north at Warm Springs. The station at Warm Springs was apparently abandoned because of bad water. The original Chorpenning trail went south and west from Blackrock to where the salt-mud desert could be traversed. The trail then turned north to Fish Springs and passed Devil’s Hole, a local landmark. Later a better route was constructed across the flats on much the same route as the present road. This new route was used by the Pony Express, stage and telegraph. The site is located on the Fish Springs National Wildlife Refuge. From Fish Springs the Express rider would go over the pass just southwest of the station site, making the distance to Boyd’s Station about 9 miles. The stage freight, telegraph and Express (in bad weather) went around the north end of the Fish Springs Range making the trip about 14 miles. Through the years, Fish Springs, being about half-way between Rush Valley and Deep Creek, became a very prominent stop. It was a HOME STATION. The monument (N39 50 53.0 W113 24 39.0) was built adjacent to the road, but the station stood a distance to the east, near the present-day camp ground. The best estimate places the old station just south and west of the big trees visible to the east, near what is called the House Spring. Today, the station site and the surrounding area are a part of Fish Springs National Wildlife Refuge, administered by the U.S. Fish and Wildlife Service. The Refuge, established in 1959, covers almost 18,000 acres, including approximately 10,000 acres of marsh land. It serves as an important stop on the migration routes of thousands of birds from dozens of species. Although Boyd Station is not identified in the 1861 mail contract, it was named by Howard Egan as an Express Station. The structure was small, one room stone cabin built of stone and contained gun-ports. It was built by and named for station keeper George Washington Boyd. There was apparently a small spring of very brackish water near Boyd Station. A well was dug to try to improve the water supply, but all that was found was brine so strong they used it to cure meat. The stabilized ruin at Boyd’s survives as one of the best preserved Express Stations in Utah. This preservation is probably due to the fact that Bid Boyd, station master, continued to occupy the site into the current century. Limited excavations and structural stabilization were undertaken at the site in 1974 and 1975. The site is interpreted on the ground by the Bureau of Land Management. There is no monument but has a small information kiosk. At this juncture the Express diverted from the old Chorpenning trail, which had gone south into Pleasant Valley and then around the south end of the Deep Creek Mountains. Egan changed to route so it headed straight west to Willow Springs Station (today’s Callao). 8 miles from Boyd Station. Controversy swirls about the station’s location. Descriptions given by PX rider Nick Wilson and by stagecoach traveler Sir Richard Burton do not describe the location of the place now claimed to be the station site. A foundation, identified tentatively as dating to the proper period and similar to the structure depicted in the sketch from an 1868 photograph, has been found at the spot where an 1882 survey plat locates the Willow Springs Stable. This structure, located on the Dorcey Sabey property, is approximately 100 feet northeast of F. J. Kearney’s boarding house. This facility is about 3/4 mile east of the structure popularly known as the station house. Further archaeological investigations are needed .This station is on private land in the small ranching community of Callao. There is a monument next to the road. The locals are sure that it is on the Bagley ranch and still stands. Originally an adobe structure, it was covered with wood to keep it from washing away. An 1875 plat locates a cabin, springs, and connecting roads at a location along Six-Mile Creek. This, coupled with historic written accounts and knowledge that Pete Joyce built and occupied a log cabin at this location, suggests its use as a station house. It is on private land next to the road but nothing remains and no monument as well. “The Indians had run off a band of horses from the Deep Creek range that belonged to a man named Kennedy. Father was in Salt Lake when he received a telegram of what had been done. He was not long in picking up a few of the range boys around the saloons that were supposed to be brave fighters, and some others, among the latter Mr. Earl. They started west, all on horseback except Mr. Earl and Father, who rode in a covered spring wagon. They lost no time and were traveling by forced marches. Father and Earl took turns at driving the two mule team, the horse-men usually riding behind the wagon. All went along all right till they arrived at a point a little ways down the canyon and east of where afterwards Canyon Station was burned. Father and Earl had just changed positions. The back curtain was loose and sometimes it was raised by the wind so as to give a good view inside to those that were riding behind. This was the case at point named, when a man, nicknamed Buffalo Bill (I have forgotten his name), so called after the famous scout of the early days, rode up close to the wagon and, as the curtain flapped up he shot Mr. Earl in the back, killing him instantly. The other riders had fallen back and did not see the shooting or know what had been done till they came up, which they soon did after hearing the shot, and when they saw what had occurred they were in for killing Bill on the spot. Father asked him if he had not made a mistake and killed the wrong man, He said, “It was an accident.” He was examining his pistol to see if it was in good working order when his thumb slipped off the hammer. He did not intend to shoot at all.” Well, there was a doubt, and they gave him the benefit of it; but he was closely watched after that with the intention of giving him over to the officers on their return to Salt Lake. 6 miles from Willow Creek and 12 miles from Willow Springs Station. This station has had 2 names as there were 2 apparent attempts at a Pony Express station in Overland Canyon. They were destroyed by fire. The first was built in the mouth of Blood Canyon near available water, and seems to have been rather short-lived. The second Canyon Station was located just west of the monument (N40 04 37.0 W113 50 44.0) which is visible across a deep wash west of the road. The station is said to have consisted of a log house with adjoining stable, and a dugout where meals were cooked and served. In July 1863 five express employees and 2 soldiers were killed when Canyon Station was burnt. Looking to the west across Clifton Flat, you will see a 2-track which is probably the remnant of the old stagecoach and PX road. Nothing remains. Canyon Station was strategically built in 1863 high above the mouth of Overland Canyon to replace an earlier, indefensible station located up Overland Canyon about 2-3 miles. Indians had besieged and burned the original Canyon Station earlier the same year. The original Canyon Station, also known as Burn’t Station, had been built by Howard Egan as an Express Station and was first described in August of 1861. A marker built and placed by the Civilian Conservation Corp (C.C.C.) is apparently located improperly. The station is believed to have been in the form of a dugout located at the mouth of Blood Canyon, so named because of the Indian attack in 1863. Other evidence indicates the site may be to the west on Clifton Flat. Descriptions vary on structural features. Apparently a dugout with stable or barn was built and possibly a log house. Round Station (N40 02 40.5 W113 48 15.0). This round, fortified rock structure was built in 1863 to serve the Overland Stage. It was probably the third incarnation of Canyon Station, the first 2 having been burned by Indians. The ruin is that of a structure probably used for defense. Visible to its south and east across the parking lot is the foundation of the station. 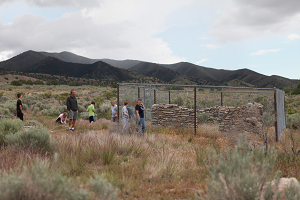 The BLM has stabilized the fortification and the station foundation and provided an interpretive ramada and parking facilities. The interpretation is the product of a cooperative agreement among the BLM, National Park Service, and the Utah Division of the National Pony Express Association. Item: The service was forced to suspend operations because of the Paiute or Pyramid Lake Indian War in May 1860. Some six-thousand Paiutes in Nevada had suffered a winter of fierce blizzards. The federal Indian agency failed to provide the food and clothing Indians had been led to expect. Fed up with white encroachments on their lands and resources, by spring the tribe was spoiling for war. When war dust gradually settled, nearly half of the twenty mail stations within the Great Basin had been razed, sixteen employees killed, and 150 horses stolen. For the rest of 1860 and into 1861, numerous small skirmishes took place. After the California volunteers had been placed along the mail line to guard the station from being attacked by the Indians, a small squad was scouting around government springs and about fifteen or twenty miles south of Simpson Springs, and in the same range of mountains. They ran onto an Indian camp and killed all that were in camp, men, women, and children, leaving none to tell the tale. When Peah-namp (the old Pah-Van-Chief) came home in the evening, he found that the soldiers had been to his camp and killed his wife and papoose and all the rest that had been left in the camp, and he had thought the whites were friendly as he was. This was too much to overlook, so he took his few men and went west to his wife’s country (she was a Go-Shute), and hunted up her relations and planned for revenge. After holding a council it was decided to attack either Willow Spring or Canyon Station, and as Canyon Station was in the mountains, and also as was reported, more men were there, it was decided to do what they could to leave it in a worse condition than the Pah-Van camp had been left. So, making their camp about three miles south, they sent two men to size up the situation. They were to go as close as they could without being seen. They did, and back they came and reported that there were five or six men there that slept in the barn where the four horses were, but the men went to the house in the ground to eat their food, and do not take their guns with them. They had reported the situation just as it was, and the next morning before day-light, they were all around the station and within easy gun shot of it. On one side there was a small ravine, not more than fifteen yards away, and on the other side another larger one a little further off. The barn was nearest the small ravine, where they prepared their fire arrows, to shoot into the canvass roof, which they done as the first gun was fired on the other side. The Indians waited till the men had been called to breakfast in the dug-out, and were all down in the hole without their guns, all except the hostler, William Riley, who was currying a horse just outside the north door of the stable at the time of the first alarm, and he was shot through the ankle and the bone broken short off. He started down the canyon on the run, but did not get far before he was caught and killed. The men at breakfast were mostly all killed as they came out of the dug-out to reach their arms that were stacked in the south end of the barn. Not one of them ever reached his gun. One man, though wounded, tried to escape by running down the canyon as Riley did. He got further away, but was caught and killed, and, as he was some bald on the top of his head, and a good growth of whiskers on his chin, they scalped that and a good growth of whiskers on his chin, they scalped that and left him where he fell. Riley they dragged back to the wood pile, threw him on and set fire to it. When the boys went up there they gathered his bones that were left, put them in a small soap box, and buried them where they had found them. The Indians got four head of horses, as much of the harness as suited them, all the guns and ammunition that was there, also all the provisions and cooking utensils that they thought worth carrying away, and everything else they burned. They took the clothes off of every man and left them just where they fell all this had been done without a shot being fired by the whitemen. A most complete surprise and massacre. 14 miles from Round Station via the original trail. It’s in today’s Utah town of Ibapah. There are 2 markers to see. First, In Ibapah near the center of town on Main Street is a Historical Monument, erected in 1997. It features 4 plaques that explain some of Ibapah’s most intriguing history, including Deep Creek Station, the Goshute Tribe, Early Settlers (with picture of Howard Egan), and the Lincoln Highway. Second, is a Pony Express monument (N40 01 47.0 W113 59 12.0). It is 1/4 mile south of the downtown monument, then take dirt road on the right and proceed one mile to monument. Deep Creek was the home of Howard Egan, the division superintendent for PX service between Salt Lake City, Utah, and Roberts Creek (near Eureka, Nevada). Well equipped, this was the most westerly station located within the present boundaries of Utah. The western boundary of the Utah Territory at this time was the California state line and Genoa the most westerly Utah Territory station. Harrison Sevier was the station master. The station site is presently on the ranch of Sidney (DeVerl) Nichols, Jr. The Egan’s Deep Creek property included a structure housing the bunkhouse, a kitchen, and a dining area. Outside the kitchen door was a yard, about sixty feet square. Across the yard on its west side stood was a large chicken house built of logs, its door facing the kitchen’s door and about forty feet from it. On the south side of the yard were stables. The bunk house was on the east, and a double row of buildings filled the whole length of the north line. The west room in this row was the telegraph office and sleeping room for an operator. Howard’s people operated the telegraph until 1868 when Jim Ferguson moved there and took it over. Some sixteen feet west of the telegraph office was the northeast corner of a field, and in that corner was the garden, fenced off along the road and fenced from the corner to the back of the hen house. Somewhere, probably by the stables, the complex had a blacksmith shop. Nearby too, but not too near, was a hog pen. The complex must have had some kind of barn for the milk cows. Before the Deep Creek ranch was purchased by Father the old trail ran south from Willow Springs around Deep Creek (now called by its Indian name of I-ba-pah), but after that ranch was bought, it was made a station on the Overland Mail Line and our principal home. Deep Creek was headquarters for many years, where Father and his sons were quite successful in raising hay and grain for the mail stations and in ranching. The home station eating house was also kept and the stations along the road supplied with beef and mutton. About twenty cows were kept for milking, which chore fell to the lot of the writer and brother Hyrum, as well as the cowboy job of riding the range for beef cattle, hunting horses and herding sheep, as well as helping on the farm, plowing, planting and irrigating, hauling hay, etc. 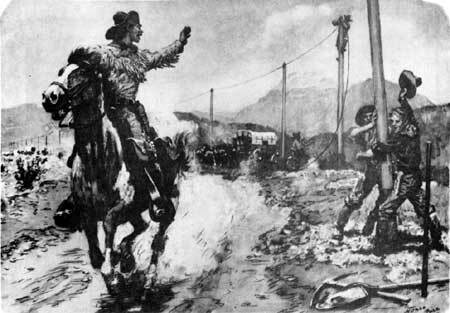 Pony Express riders in 1861 galloped past workmen erecting tall poles and stringing telegraph wire for a transcontinental telegraph system. The Overland Telegraph Company and the Pacific Telegraph Company (Western Union) were formed. The latter started erecting poles and lines from Omaha to Salt Lake City, and the former worked eastward from California. On the west wing, installers pretty much followed the Pony Express route from Virgina City, Nevada. Wagons hauled poles by the hundreds and the wire and equipment to where the pole installers were. The line was first measured and staked off; the hole-diggers followed; then came the pole-setters, and next the wire party. The line was strung up at the rate of from three to eight miles a day. On October 18, 1861, Pacific Telegraph lines reached Salt Lake City, meeting the line from Omaha on October 24. That day President Lincoln received a telegraph message from California saying “the telegraph to California this day has been completed.” In early November the last eastbound mail delivered in Atchison, and on November 18 the last run was ended in Sacramento and San Francisco. Riders made a total of 308 runs each direction, covering a total of 616,000 miles. They carried 23,356 pieces of mail going east and 11,397 pieces going west, for a total of 34,753 pieces. That would average about 113 pieces per run. Californians used the Pony service more than people in the East, so more Pony Express mail went east than west. To the credit of three Egans and their families, their brawn and brains and devotion helped make the Pony Express’s mission, “the mail must go through,” succeed. Today the nearly 2,000 mile long Pony Express route officially is the Pony Express National Historic Trail. Located in eight states, it is administered by the National Park Service. The five-mile long canyon was named for Howard Egan. The Pony Express station here was located in a meadow at the west end of the canyon. In 1860, this station was used by the Pony Express as a change station, and from 1861 to 1869 it was an Overland Stage station. Egan Canyon provided many anxious moments for Pony Express riders as well as travelers. It was an ideal location for Indian ambushes. In October 1860 Indians burned Egan Station. When traveler Richard Burton arrived at Egan Station on October 5, 1860, he found part of the chimney, a few pieces of burned wood, and evidence of partially buried bodies. Burton states this killing was retaliation for the Indians killed by U.S. soldiers. For Highway Travel, Egan Canyon is located approximately 80 miles south of West Wendover, Nevada, off of US 93. To Egan Canyon from Deep Creek/Ibapah. 2 hours and 88 miles. No services. From Ibapah, drive north and then northwest on Ibapah Road 32.5 miles to dead end at highway 93Alt (which runs between Wendover and Ely). Turn left, south, on 93Alt and drive 33.3 miles, at which point 93A becomes 93, and continue on it for 14.2 miles. Turn right/west (signs for Cherry Creek) on NV 489 for 8.2 miles. You then enter Cherry Creek, which is half ghost-town. In Cherry Creek Turn left (south) on second street. Drive about 5 miles and don’t turn left anywhere (2 chances) but follow that road as it enters and take you through Egan Canyon. To Egan Canyon from West Wendover (from Salt Lake City on I-80). Drive south from West Wendover on 93A for 26 miles. At that point on the left is the Ibapah Road if you want to drive to Deep Creek, which is 32.5 miles from 93A. But for Egan Canyon, stay southbound on 93A and travel from the Ibapah Road point 33.3 miles, at which point 93A becomes 93. Stay on 93 for another 14.2 miles. Turn off there for Cherry Creek (it’s marked) and drive 8.2 miles into the half-ghost town of Cherry Creek. In Cherry Creek Turn left (south) on the second north/south street. Drive about 5 miles and don’t turn left anywhere (2 chances) but follow that road as it turns and enters and take you through Egan Canyon for five miles. From Cherry Creek back to West Wendover is 83 miles. From West Wendover to Salt Lake City is approx. 123 miles, just under 2 hours. 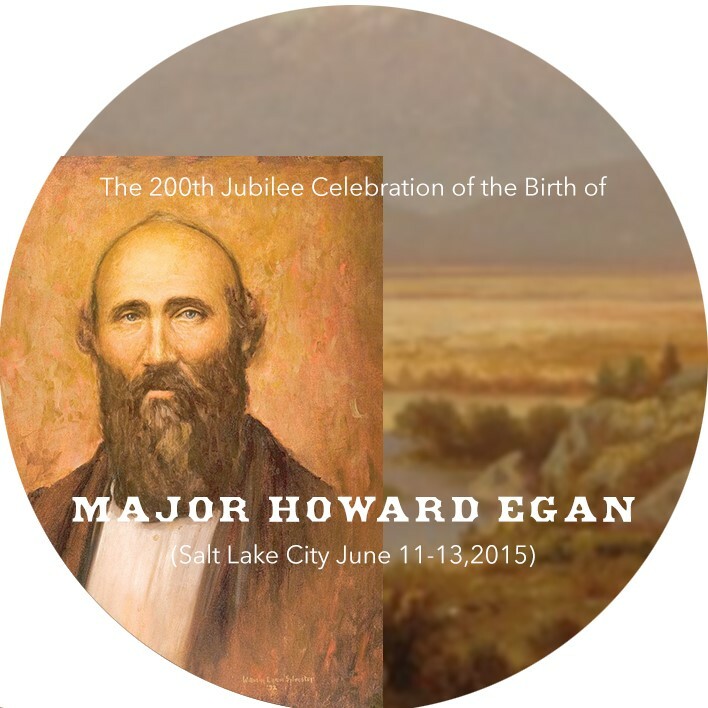 Note: The canyon was named for Howard Egan who had been in the area since the 1850s. He later became a Pony Express agent. Egan Canyon was the site of many Indian ambushes. In July 1860, U.S. troops travelling from Fort Ruby to Schell Creek came upon an Indian attack at the station barely saving the lives of the 2 station masters. 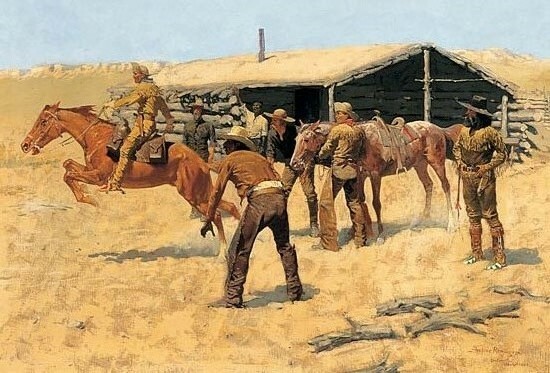 Indian survivors of that skirmish took revenge on the next Pony Express stop, Schell Creek Station, killing the station master and 2 assistance and running off all of the livestock.